Vibratory bowl feeders are a very common type of parts feeder, and they are a critical part of an automated assembly system. Vibratory bowl feeders move parts around a bowl and into channels in a way that ensures they are perfectly aligned for how the automation system needs them. Vibratory bowl feeders make sure parts are continually being presented to the automation system, so that it can perform as designed and maintain a high production rate. 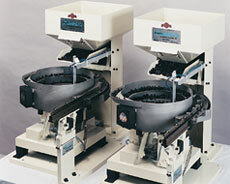 Vibratory bowl feeders also reduce labor, because they require very little human interation. We can develop vibratory bowl feeders from 6″ to 36″ in diameter. For optimum efficiency, we design and fabricate our bowl feeders simultaneously. Each bowl is custom built to meet the customer's exact specifications, regarding part configuration, feed rate and orientation. To ensure the precise handling of almost any size and type of part, whether small or large, delicate or heavy duty, every Dial-X bowl feeder is designed and hand-crafted in-house using 11-gauge stainless steel. Type 304 stainless steel is standard, while Type 316 stainless steel is used in medical applications. For further information or a free quote on vibratory bowl feeders, contact Dial-X Automated Equipment, Inc.